​The Emergency Santa Claus Mystery is a FREE 15 page downloadable mystery entertainment for children (and adults) which takes place over the period December 14th to December 24th. Santa Claus and his reindeer have unfortunately suffered an accident while on a practice sleigh flight. Christmas will have to be cancelled unless a replacement can be found! Each day a new piece of information/puzzle is revealed. You can see details of how the mystery unfolds below. 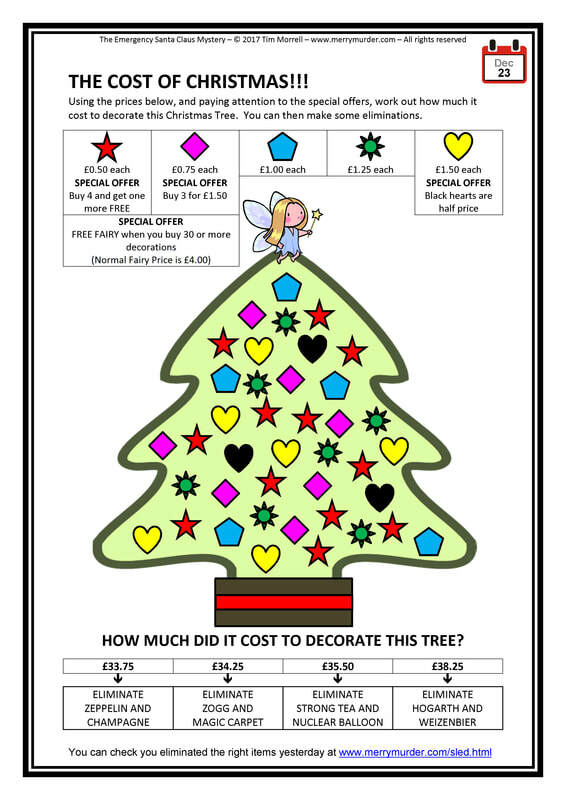 Or alternatively download the free preview PDF showing the items from Dec 14th to Dec 17th. To obtain the FULL free download, simply put through an order using the "Add to Cart" button on the right. I hope you and your family/friends enjoy it! To obtain the FULL DOWNLOAD for FREE, simply put through an order using the button below. Please share with your Facebook friends. Thank you. 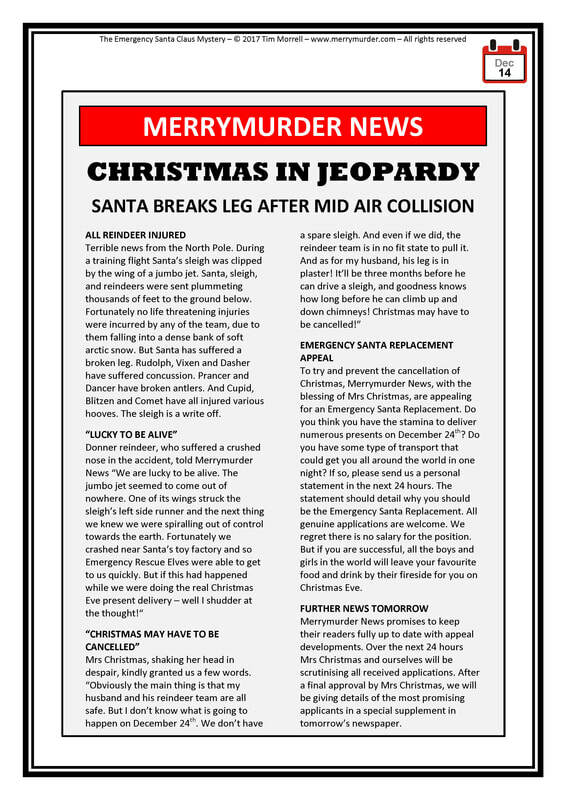 Dec 14th - A copy of the “Merrymurder News” front page revealing that Santa has had a sleigh accident while out on a training flight. Although no one is fatally injured, Santa has broken his leg and the reindeer are not in a fit state to fly. Also the sleigh is a write off. 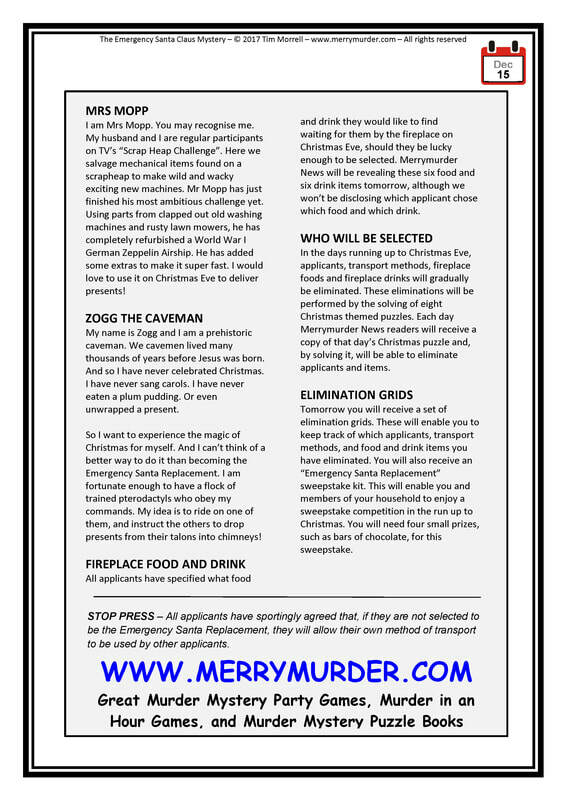 Mrs Christmas expresses her fears that Christmas will have to be cancelled, and the Merrymurder News launches an appeal for "Emergency Santas" to get in touch overnight. The applicants are asked to send in a personal statement explaining why they should be considered, what method of transport they propose to use to deliver the presents, and what special food and drink items they hope children will leave for them in the fireplace. 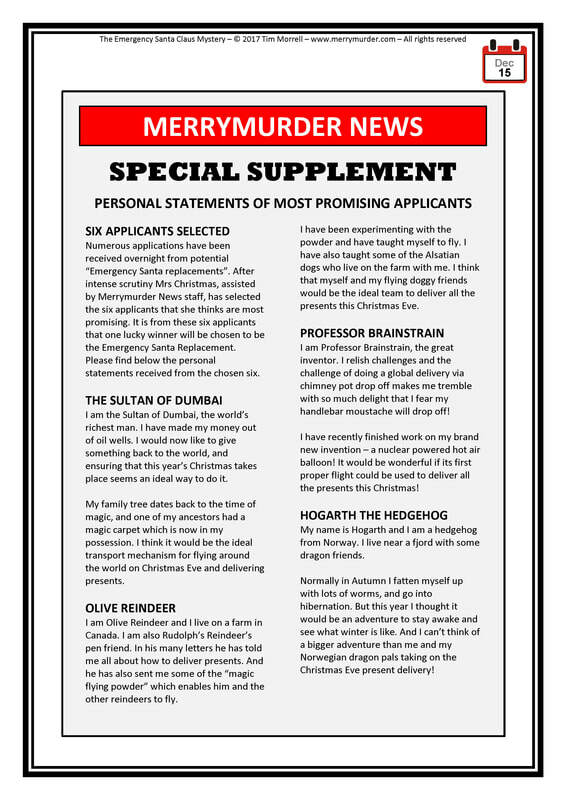 Dec 15th - A two page "special supplement" from the merrymurder news, revealing the six most promising applicants and the method of transport that each has proposed. It is also revealed that from December 17th onward, a Christmas themed puzzle will be released each day. 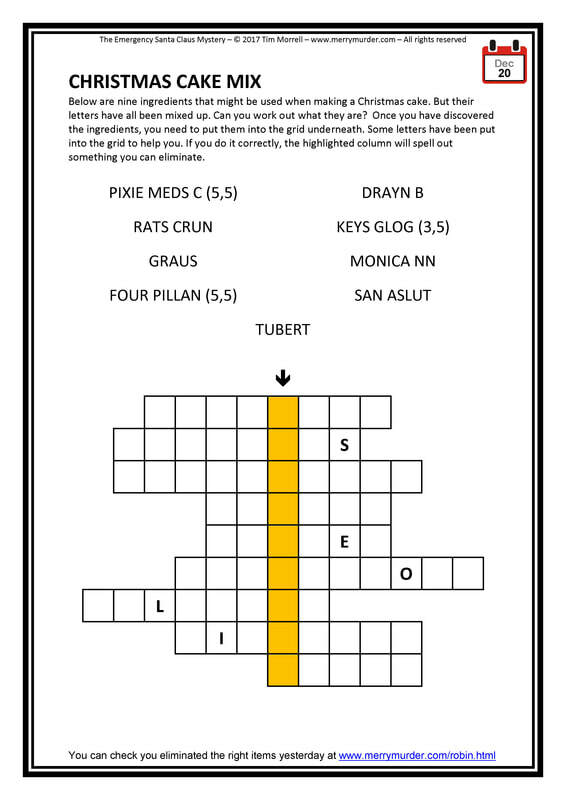 These puzzles will cause applicants, transport methods, fireplace foods and fireplace drinks to be gradually eliminated. 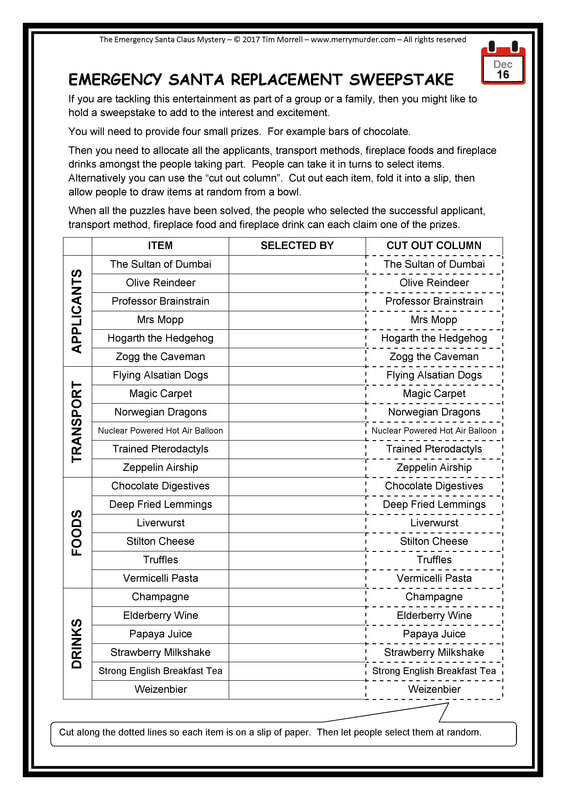 By Christmas Eve there will only be one item in each category left, meaning full details of the Emergency Santa Claus Replacement will be known. 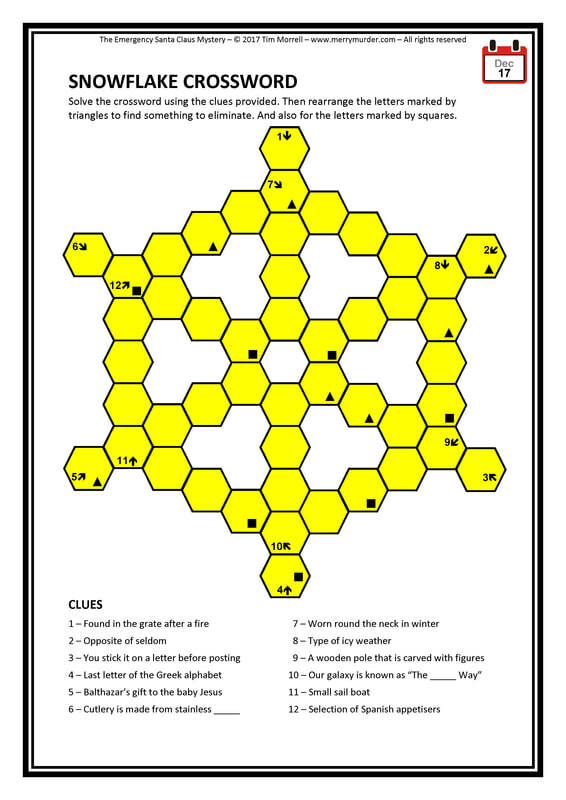 Dec 16th - A page of elimination grids, so that puzzlers can keep track of who they have eliminated each day. 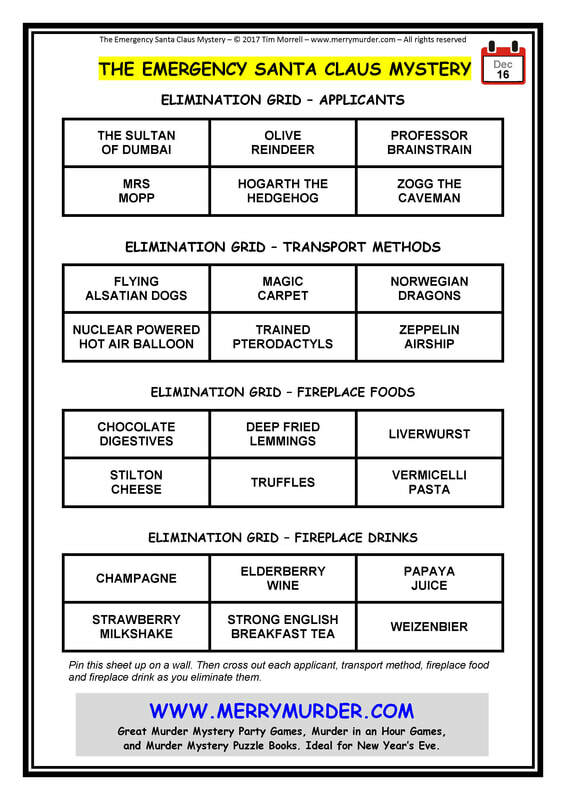 And an "Emergency Santa Replacement" sweepstake sheet, in case participating households and families wish to add a little extra excitement to the entertainment. 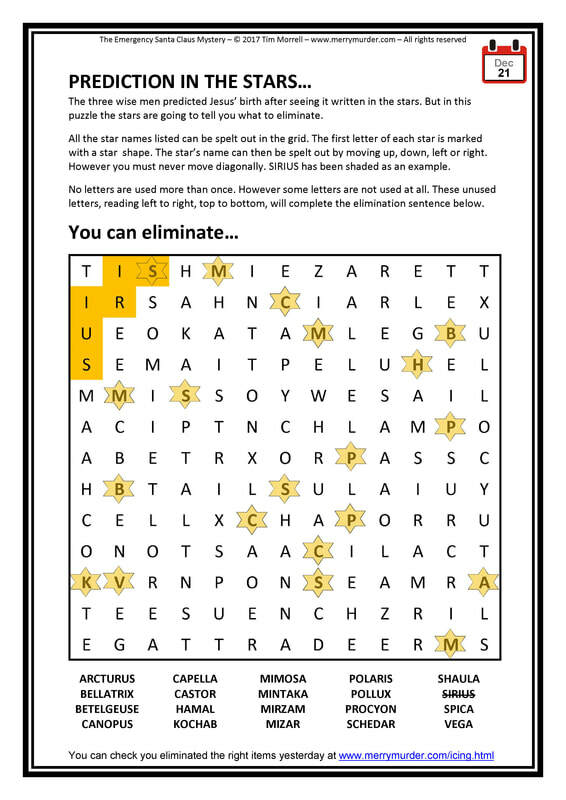 Dec 17th - The first puzzle in the form of a "Snowflake Crossword". First the crossword needs to be solved. Then the letters in certain marked squares need to be rearranged. Once in the right order they will spell out the names of two items that can be eliminated. 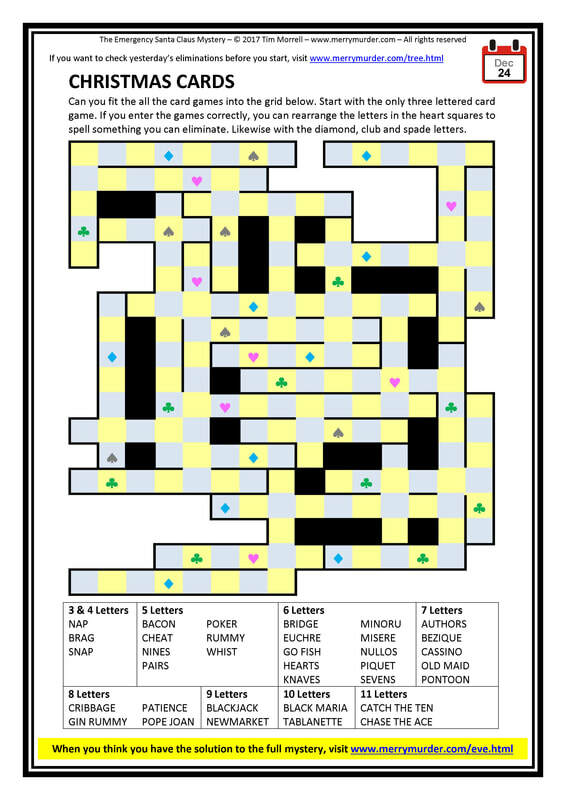 Dec 18th to Dec 24th - The remaining puzzles can be seen below. 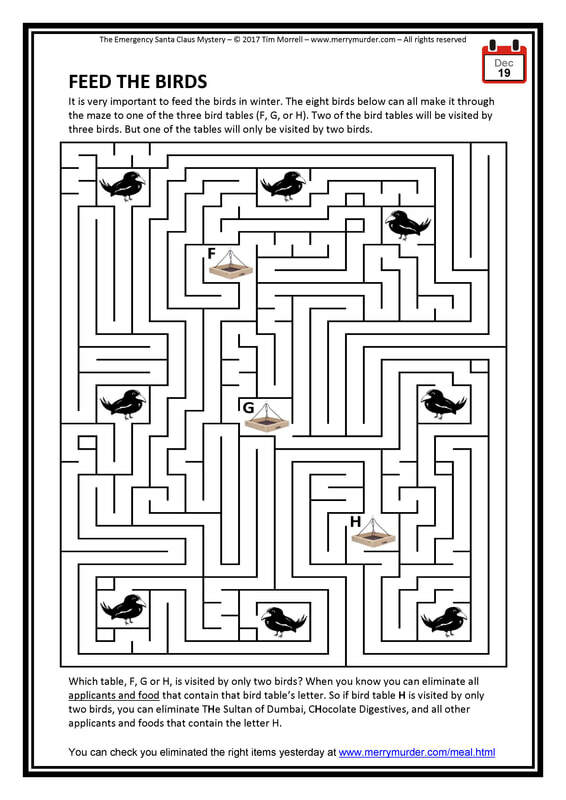 At the foot of each new day's puzzle is a web link which allows puzzlers to check that they made the correct eliminations the previous day. 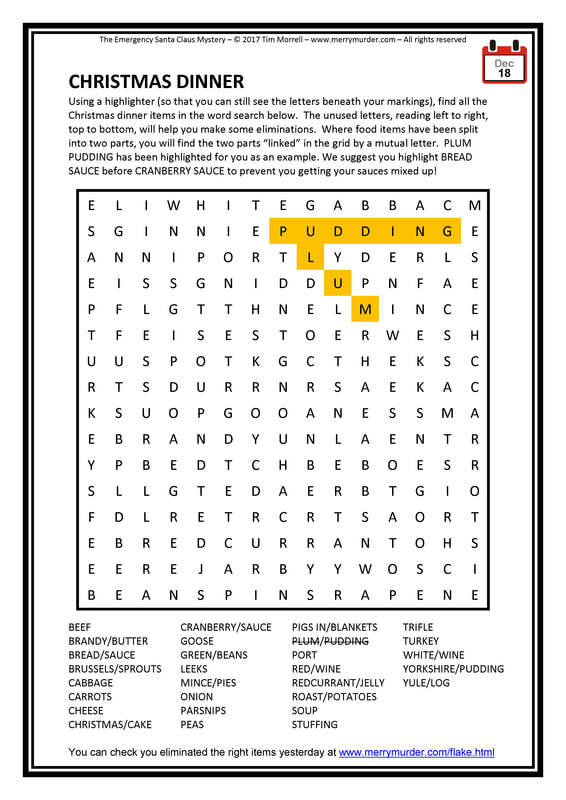 ​When the last puzzle is solved there should be only one applicant, one transport method, one fireplace food and one fireplace drink which have not been eliminated. These items form the solution to "The Emergency Santa Claus" mystery. 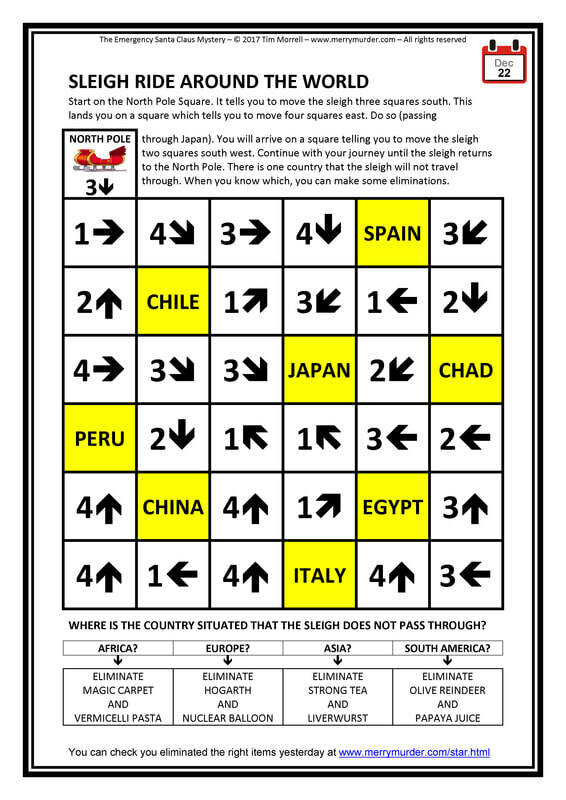 A web link is given with the final puzzle which takes you to a photo of the emergency Santa making their deliveries! From this you can verify that you have the correct solution. ​"Sleigh Ride Around the World"